We’re looking for the next generation of food & beverage and event professionals at all levels to join the opening crew of The Catered Affair’s newest operations in the Boston Public Library. 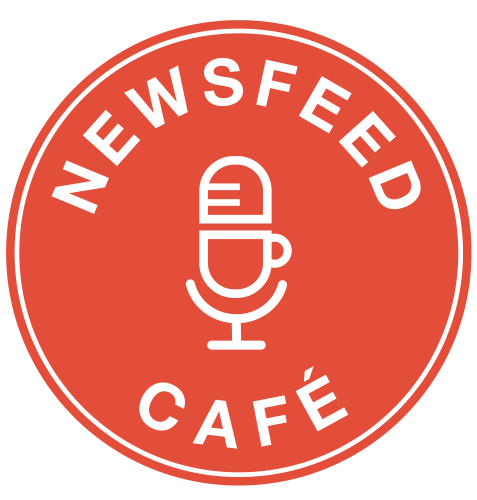 You’ll join us at an exciting moment as we’re poised to open the Newsfeed Café, a dynamic and innovative new space in the library’s renovated Johnson building. Now available, restaurant jobs in Boston, MA in food & beverage, events, or both at The Catered Affair’s operations at the Boston Public Library. Opening in summer 2016, the Newsfeed Café is an exciting new space for lovers of lattes and literature alike. This dynamic, innovative café and event space, located in the newly renovated Johnson building, will serve impeccable breakfast items, lunch fare, and baked goods alongside finely crafted espresso drinks and premium teas. We will be the go-to spot for the thousands who live and work near Copley—and the thousands more who visit the Boston Public Library each day. 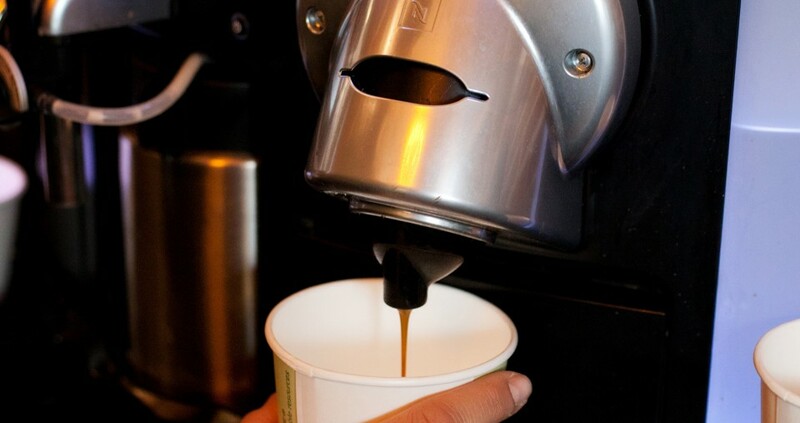 Yet we imagine our café as much more than a place to dine and drink. Through our daily operations and the special events and programming that we’ll develop for the unique venue, entering the Newsfeed Café will be an invitation to curiosity, creativity, and community. Patrons will be steps from the library’s stunning and interactive new welcome center. They’ll also have a front-row view of the adjacent WGBH remote studio, which will produce news broadcasts, educational programming, and topical events. Our reimagining of the “café” is an exciting moment—to connect the brilliant food and flawless service that are The Catered Affair’s hallmarks and the dynamic engagement in 21st-century urban civic life heralded by the Boston Public Library’s renovation. Making this happen will take creativity, dedication, fearlessness, curiosity, a love of team, an innate sense of hospitality, and a great sense of fun. If this sounds like you, we want you as part of our opening crew. 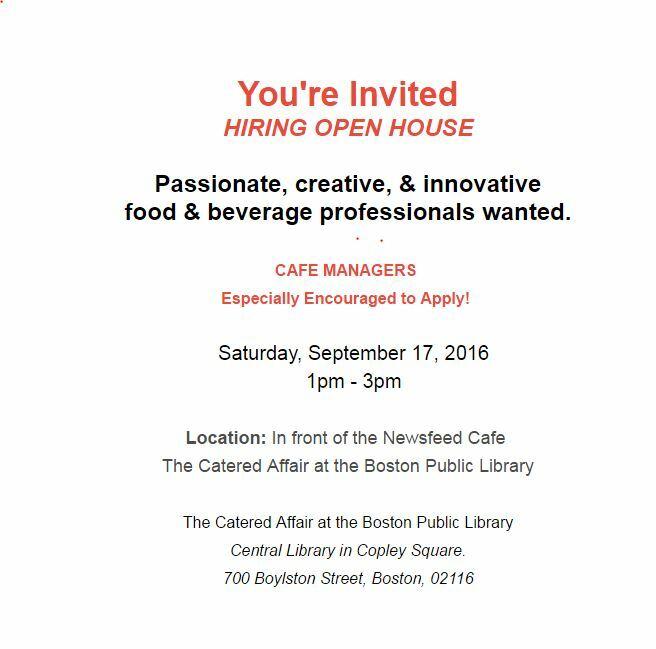 We’re hiring for the following positions at the Newsfeed Café and The Catered Affair’s other outlets in the Boston Public Library. All levels of experience will be considered. We are fully committed to training and cultivating our team members for growth. Full- and part-time opportunities are available. Full-time team members are eligible for benefits, including health and dental insurance, FSA, paid holidays, sick time, and vacation time. 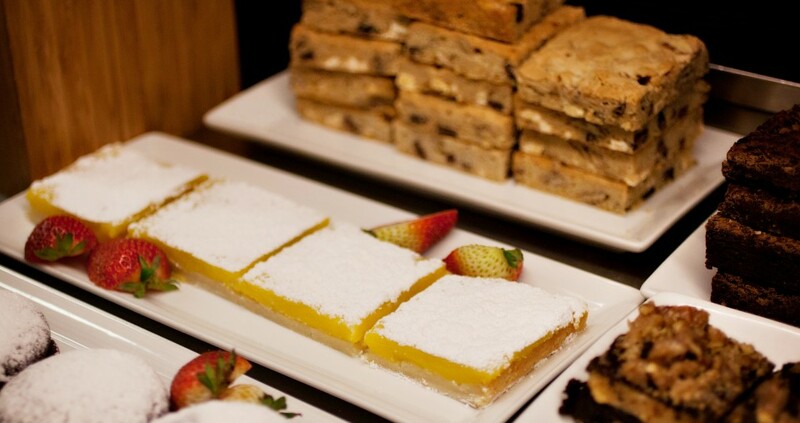 The Newsfeed Café is owned and operated by The Catered Affair. To apply, submit your resume and an application to jobs@thecateredaffair.com or drop off your application in person at The Catered Affair’s Map Room Café in the Boston Public Library (700 Boylston Street), Monday – Saturday, 9am – 5pm. We’d love to meet you! 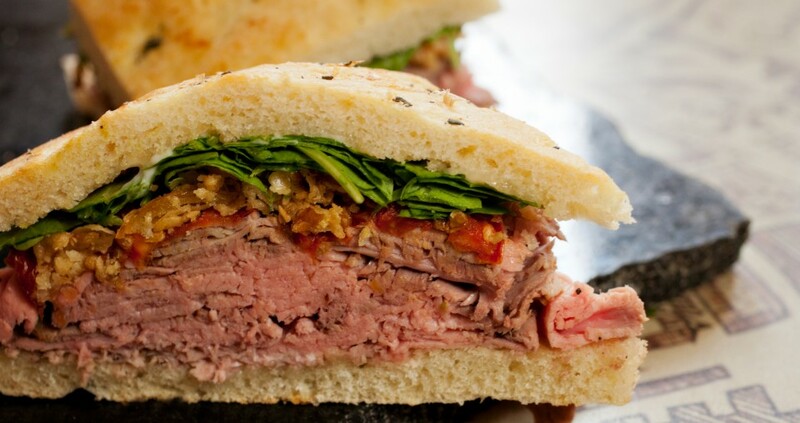 In the late 1970s, the New American Cuisine movement exploded and the city of Boston was hungry for someone to take event catering to the next level. Enthusiastic amateur chef and party giver Holly Safford was regularly encouraged by friends and guests to consider becoming a caterer. Starting in her home kitchen with a few cookbook recipes, a toaster oven, and a natural flair for entertaining, Holly quickly became a household name among Boston-area food connoisseurs. Working with Julia Child as a recipe tester solidified her reputation as one of New England’s leading culinary experts. 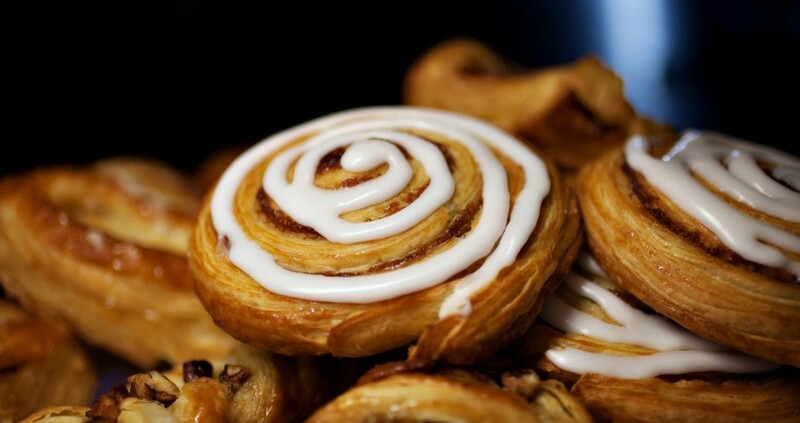 Thirty seven years later, her perseverance, culinary vision, and inimitable style have made The Catered Affair (TCA) a nationally recognized full-service catering company in New England. Holly is joined by sons Andrew and Alex and a team of over 300 who share her uncompromising commitment to exceptional food, presentation, and service. TCA executes events beyond its clients’ highest expectations in private homes, our partner venues, our cafés and restaurants, and in unique locations throughout New England and beyond. Our team of event producers, event managers, and production coordinators work together with an exceptional culinary staff to create the highest quality events.